Go to original pattern for design DROPS 94-14. DROPS Cardigan in Alpaca and scarf in Vivaldi. 300-350-350-400-450 g colour no. 2917, Turquoise. Drops silver button no. 534 : 6 or 7 pcs. 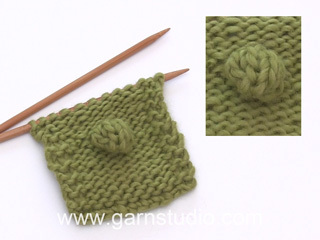 You can get the yarn to make this pattern from	19.20£. Read more. 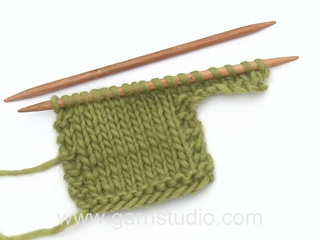 Knitting Gauge: 23 sts x 30 rows on needles size 3 mm with Alpaca in stocking sts. 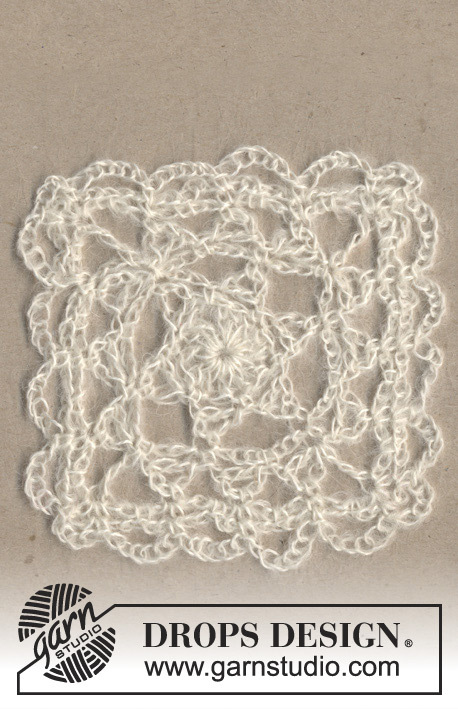 = 10 x 10 cm. Pattern: See diagrams M.1 to M.6. The diagrams are seen from the right side. (= right side): *K2 tog. make a yo*, repeat from *-* and finish off with K1. 4th row (= right side): K1, *make a yo, slip a st as if to knit, K1, psso*, repeat from *-*. Repeat row 1 to 4 a total of 4 times. Bind off tips (for the neck shaping): Bind off after 1 edge st: Slip a st as if to knit, K1 psso. Bind off before 1 edge st: K2 tog. Body: Please read all of the pattern before you knit! The cardigan is knitted forward and backward on circular needles starting from the centre mid front. Cast on 176-194-212-239-257 sts (inclusive of 1 edge st each side mid front) on circular needles size 3.5 with Alpaca. Purl 1st row from the wrong side. Knit the next row from the right side as follows: 1 edge st (knitted in garter sts on all rows), M.1A over the next 171-189-207-234-252 sts, M.1B (= 3 sts) and 1 edge st (knitted in garter sts on all rows). 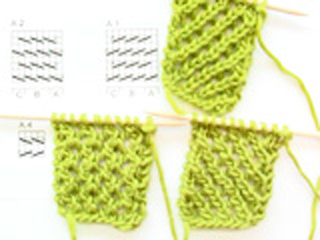 When the piece measures 5 cm – adjust the length to a finished pattern repeat - knit 5 rows of garter sts beginning from the right side. Continue in M.2 with an edge st each side mid front. Insert a marking thread 45-49-54-60-65 sts in from each side (= 86-96-104-119-127 sts between the marking threads for the back). At the same time when the piece measures 8-8-8-10-10 cm inc. 1 st both sides of the marking thread on every 3.5-3.5-3.5-4-4.5 cm a total of 5-5-5-4-4 times = 196-214-232-255-273 sts – knit new sts in stocking sts, when finished increasing remove the marking threads. When the piece measures 22-23-24-25-26 – make sure the next row is from the wrong side and uyou have knitted at least 2 rows of stocking sts after a row of lace holes – knit M.3 – at the same time on the last row of M.3, adjust the number of sts to 195-219-235-259-275. After M.3 knit the next row from the right side as follows: 1 edge st, M.4 over the next 192-216-232-256-272 sts, 1 stocking st and 1 edge st. Continue the pattern like this – at the same time on the last row of M.4 bind off 16 sts evenly distributed on row = 179-203-219-243-259 sts. Continue in net pattern – see explanation above. Repeat the net pattern 3 times and change to M.3 at the same time inc. 17 sts evenly distributed on row on the first row of M.3 = 196-214-232-255-273 sts. At the same time on the last row of M.3 knit from the wrong side as follows: Knit 45-49-54-58-63 sts (= left front), bind off 10-10-10-12-12 sts for the armhole, knit 86-96-104-115-123 (= back piece), bind off 10-10-10-12-12 sts for the armhole and knit the last 45-49-54-58-63 sts (= right front). The piece now measures approx 32-33-34-35-36 cm. Now put the work aside and knit the sleeves. Sleeve: Cast on 54-54-54-63-63 sts on double pointed needles 3.5 with Alpaca. K 1 round and continue with M.1A. 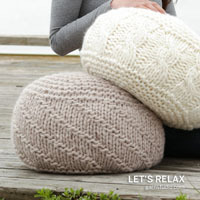 When the piece measures 11 cm - adjust the length to a finished pattern repeat – knit M.5A. Now knit M.2 – make sure the holes are nicely located over the “bubbles”. At the same time when the piece measures 15 cm inc. 2 sts mid under arm a total of 12-14-17-15-17 times on every: Size S: 8th round, Size M: 7th round, Size L: Alternate between every 5th and 6th round, Size XL: 6th round, Size XXL: 5th round. Incorporate the new sts in pattern as you go along. At the same time when the piece measures approx 38-37-37-36-36 cm – make sure the numbers of rounds in stocking sts (in M.2) are the same as for the body before M.3 – knit M.3. 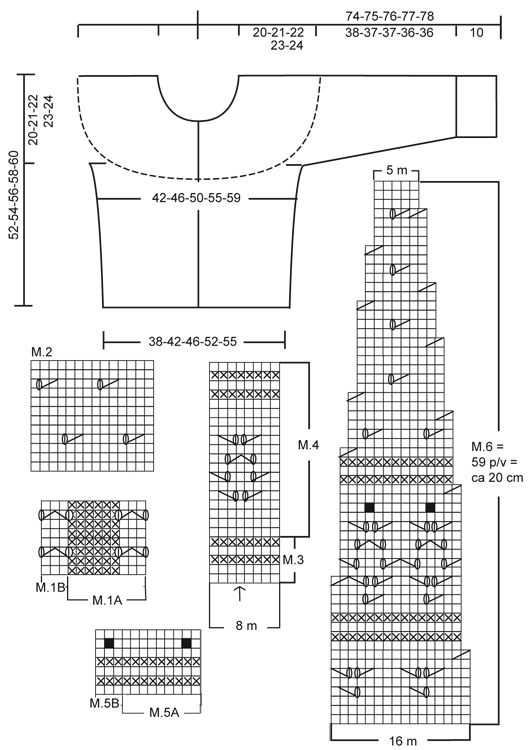 After M.3 knit M.4 – adjust the pattern so a lace pattern is at the centre top of the sleeve – see the arrow in diagram. At the same time on the last round of M.4 bind off 3-3-3-4-4- sts evenly distributed. 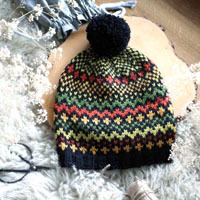 Continue in net pattern as for the body but knit the first and third round (i.e. no pattern). Continue in M.3 at the same time on the 1st round inc 3-3-3-4-4 sts evenly distributed. After all dec and inc there are 78-82-88-93-97 sts on round. At the same time on the last round in M.3 ( the piece now measures 48-47-47-46-46 cm) bind off 10-10-10-12-12 sts at the centre underneath the sleeve = 68-72-78-81-85 sts. Put the remaining sts on a thread and knit another sleeve. 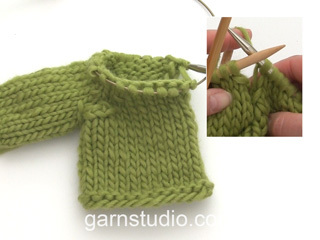 Put the sleeves in on the same circular needle as the body where you bound off for armholes = 312-338-368-393-419 sts. 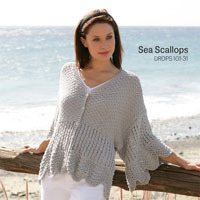 Knit 1 row from the right side at the same time adjusting the number of sts to 306-338-368-386-418. Continue to knit and bind off according to M.6 (remember the edge st at each side as before). At the same time bind off 1 st for the V neck at the centre front on every other row – see bind off tips: a total of 30-31-33-34-36 times. After all bind off’s there are 69-77-78-86-92 sts left on row. When finish with M.6 and the V neck shaping continue in stocking sts until the piece measures 52-54-56-58-60 cm. K 1 row from the right side at the same time adjusting the number of sts evenly distributed on row to approx 35-45 sts. Bind off loosely on the next row. Assembly: Sew the openings under the arms. Front and neck edge: Pick up 278 – 323 sts (divisible by 5 + 3) on circular needle size 3 with Alpaca – Pick up from the right side up along the right front piece, to the back and down along the left front piece. Knit 2 rows of garter sts. Continue as follows: 1st row (=the wrong side): *K3, P2*, repeat from *-* and finish with K3. 2nd row: K over all sts. 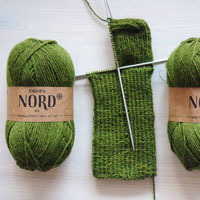 Repeat row 1 and 2 – NB: In the bend where the neck shape starts on both front pieces, inc. 1 st on every other row a total of 3 times so the edge doesn’t get too tight. It looks nicest to inc. in the 3rd P st or 2nd K st (seen from the right side). Knit the new sts the same as the st you inc. in. At the same time when the front edge measures approx. 1 cm bind off for 6 – 7 button holes evenly distributed on the right front edge. 1 button hole = bind off 2 sts and cast on 2 new sts over the bound off sts on the next row. The first button hole should be 1-2 cm from the bottom edge and the top should be at the bend where the v neck starts. When the front edge measures approx 2.5 to 3 cm bind off loosely from the wrong side in with K over K and P over P.
1st square: crochet 4 ch, on hook size 3.5 with Vivaldi and make a loop with a sl st.
1st round: 3 ch,, 11 tr around the ring, finish with a sl st in the 3rd ch from beginning of round. 2nd. round: *4 ch, 1 tr in the 1st of the 4 ch, skip 1 tr, 1 sl st in the next tr*, repeat from *-* a total of 6 times and finish with a sl st in the sl st from the end of the previous round = 6 leaves. 3rd round: 3 ch, 1 dc in the top of the 1st leave, *7 ch, 1 dc in the top of the next leave* repeat from *-* a total of 6 times and finish with a sl st in the dc at the top of the 1st leave = 6 loops. 4th round: *4 ch, 1 tr in the 1st of the 4 ch, 1 dc around the loop, 4 ch, 1 tr in the 1st of the 4 ch, 1 dc in the dc between the loops*, repeat from *-* a total of 6 times and finish with a sl st in the sl st from the end of the previous round = 12 leaves. 5th round: 3 ch, *1 dc in the top of the 1st leave, 4 ch, 1 dc in the top of the next leave, 4 ch, 1 dc in the next leave, 4 ch, 1 dtr in the dc between the next 2 leaves, 4 ch*, repeat from *-* a total of 4 times and finish with a sl st in the 1st dc from beginning of round = 4 double corner tr and 16 ch loops. 6th round: *2 ch, 1 dc around the loop, 2 ch, 1 dc in the top of the leave, 2 ch, 1 dc around the loop, 2 ch, 1 dc in the top of the leave, 2 ch, 1 dc around the loop, 2 ch, 1 dc in the corner tr, 2 ch, 1 dc in the corner tr, 2 ch, 1 dc in the loop, 2 ch, 1 dc at the top of the leave*, repeat from *-* a total of 4 times, but finish with a sl st in the sl st from the end of the previous round = 36 ch loops. 7th round: * 6 ch, skip 1 dc, 1 dc in the next dc (over the leave), 6 ch, skip 1 dc, 1 dc in the next dc, 6 ch, skip 1 dc, 1 dc in the next dc (= 1st dc in the corner), 4 ch, 1 dc in the next dc (= 2nd dc from the corner), 6 ch, skip 1 dc, 1 dc in the next dc* repeat from *-* a total of 4 times, finish with a sl st in the sl st from the end of the previous round. Cut the thread. Crochet another 13 squares. 1st row: 1 dc in the corner of one of the end squares, *8 ch, skip approx. 2 cm (adjust the space so there is room for 5 loops in between), 1 dc in the next st*, repeat from *-* a total of 5 times, turn the piece. 2nd. row: 4 ch, 1 dc in the top of the 1st loop, *8 ch, 1 dc in the top of the next ch loop*, repeat from *-* a total of 4 times, turn the piece. 3rd. row: 4 ch, 1 dc in the top of the 1st loop, *8 ch, 1 dc in the top of the next loop*, repeat from *-* a total of 3 times, turn the piece. Continue as above another 2 rows, i.e one less loop for each row. Repeat the other end of the scarf. = Bobble – Work 5 sts in this st, in the front and back loop of st alternately, turn. Work 4 rows stocking sts on these 5 sts. Then pass st no 2 on right needle over st no 1, pass st no 3 over st no 1, pass st no 4 over st 1 and pass st no 5 over st no 1 (= 1 st left). Ja, omdat je de gemeerderde steken in tricotsteek breit, en en niet in A.3 heb je hier geen last van. De gemeerderde steken in de zijnaden brei je in tricotsteek. Dear Mrs Douglas, that's right, M.2 is worked starting from WS (= you first work 5 rows with M.1 starting from RS = last row will be worked from RS so that M.2 starts on next row from WS). "Adjust the length to a finished pattern repeat" means to work more or less than the cm given, the most important will be here that you have worked a whole repeat of the diagram in height. Happy knitting! Hoi Ellen, In beide zijkanten heb je een markeerdraad en je meerdert telkens aan beide kanten van de markeerdraad, dus per keer meerder je 4 steken en dan komen er dus in totaal 16 steken meer op de naald. Der Kettrand der Kante zieht sich trotz sehr lockerer Technik (+eine ganze Nadelnr. größer) sehr stark zusammen, wodurch die ganze Optik etwas leidet. Hier würde ich empfehlen anstatt den Rand zum Schluss anzustricken, ihn als Blende gleich mit ins Muster einzuarbeiten. Außerdem sind Silberknöpfe nicht empfehlenswert. Sie sind für die zarte Jacke viel zu schwer. Ich habe eine Frage zum Ärmel. Wenn ich aus dem Muster M1A komme, ist die letzte Runde links. M5A beginnt dann auf der rechten Seite. Die Noppe würde dann auf der linken Seite gestrickt werden. Das kann ja eigentlich nicht richtig sein, oder? Sie stricken die Ärmel in Runden, nicht in Hin- und Rück-R, dann ergibt sich das Problem mit der Noppe nicht. Das ist in der Anleitung leider etwas missverständlich, die Anleitung wird diesbezüglich gleich verdeutlicht. Bonjour Elisabeth, le diagramme M.2 se tricote sur 14 m et 11 rangs (1 case = 1 m x 1 rang) et se lit en commençant en bas à droite vers la gauche sur l'envers, ainsi le 1er rang ajouré (=4ème rang du diag.) se tricote ainsi : 1 m end, 2 m ens à l'end, 1 jeté, 5 m end, 2 m ens à l'end, 1 jeté, 4 m end. Pour l'empiècement, on répète le diag. M.6 sur toutes les mailles, ainsi on diminue régulièrement pour former l'empiècement. Bon tricot! Inmiddels ben ik bij het bovenstuk bezig maar ik kom er helaas niet uit. Het patroon M6 past 22 keer in de 354-2 kantsteken is 352 steken van de bovenpas. Maar doordat ik voor de schuine hals uistsnijding ook moet minderen past op den duur niet meer 22 keer het patroon er in dus ook niet het aantal minderingen wat aangegeven wordt in M6. Ik hoop dat u begrijpt wat ik bedoel en dat u me kunt helpen want hoewel ik het al verschillende malen opnieuw hebt geprobeerd wil ik het toch graag afmaken. Het klopt dat u tegelijkertijd met de minderingen volgens M6 ook moet minderen voor de halslijn. Dat betekent dan ook dat de herhaling van M6 niet meer past (22 keer). U heeft dus minder st per herhaling M6 dan op de teltekening. U breit dan de st zoals ze zich voordoen (of zo goed mogelijk passen met het motief), maar de minderingen moeten blijven doorgaan om uit te komen op het correcte aantal st: 46 incl. de 2 kantst.